with short-term insurer Santam, at an exclusive VIP luncheon at Summer Place in Hyde Park earlier today. The two inspiring winners were selected from an incredible shortlist of finalists by a respected panel of successful business-minded and well-known South African judges, including Santam Executive Head of People & Transformation Jeanett Modise; Advocate Thuli Madonsela; media entrepreneur & international speaker Jo-Ann Strauss; jewellery designer and businesswoman Kirsten Goss and FAIRLADY editor Suzy Brokensha. 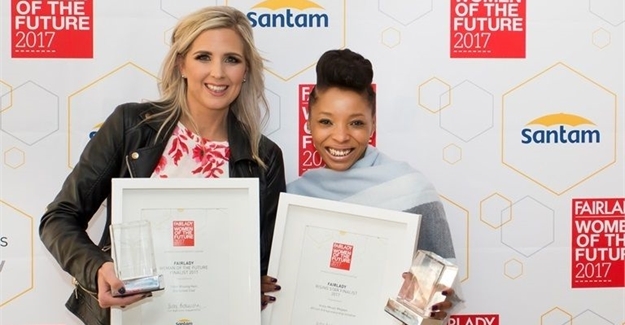 Tiffini Wissing Hein, owner of Old School Cool, won the FAIRLADY Woman of the Future 2017 title. Old School Cool provides safe and reliable transport with their flagship service Cool (kids) Cabs for children of swamped, over-scheduled parents. The company’s main focus is the safety of the children they transport. The vehicles are fully kitted-out with a huge number of safety features, and a team of supervisors monitors them 24/7 via on-board cameras. Old School Cool employs and empowers 40 women, and Tiffini believes her company is ‘a testament to girl power’. Her dedication and unrelenting perseverance – as well as her ability to spot the gap created by unreliable public transport – has been the secret to her success. In true entrepreneurial spirit, Tiffini plans to plough her prize money straight back into the business. The FAIRLADY Rising Star 2017 Award winner is Anele Mkuzo-Magape, founder of the African Entrepreneurship Initiative. For Anele, winning the FAIRLADY Rising star award has been a massive honour, and she feels it shows young entrepreneurs ‘that there are initiatives geared to supporting them’. The African Entrepreneurship Initiative is a consulting service that allows the youth of our country to access financial literacy and entrepreneurship education. Through several customised training programmes, tailored personal development, business coaching and mentorships, struggling entrepreneurs are able to get the support they need to succeed. Anele believes that entrepreneurs are ‘born and made’ and that gaining knowledge from your peers is vital to the entrepreneurial journey. She leads by example, and will use her prize money for a research project focusing on some of the entrepreneurs as case studies. Guests in attendance at the luncheon today included: businesswoman Wendy Luhabe; Media and TV personality Leanne Manas; philanthropist and author Sonia Booth; TV presenter Thembisa Mdoda; Miss South Africa Demi-Leigh Nel-Peters; actress and model Jena Dover; actress and presenter radio and TV personality Leigh-Anne Williams; businesswoman and TV personality Dawn Nathan-Jones and businesswoman Wendy Luhabe. The 2017 FAIRLADY Woman of the Future winner, Tiffini Wissing Hein, receives R50 000 in cash, a mentoring session with one of the judges, a Sisley beauty hamper worth R8 797, a Miladys fashion voucher worth R5 000, a GetSmarter local online course worth R15 000, a Michel Herbelin watch worth R10 500, business luggage from Delsey worth R5 000 and a Lenovo 2-in-1 Laptop (Wi-Fi) from Makro worth R3 999. FAIRLADY Rising Star 2017, Anele Mkuzo-Magape, receives R20 000 in cash, a mentoring session with one of the judges, a Sisley beauty hamper worth R5 465, a Miladys fashion voucher worth R5 000, a GetSmarter local online course worth R15 000, a Michel Herbelin watch worth R10 500, business luggage from Delsey worth R5 000 and a Lenovo 2-in-1 Laptop (Wi-Fi) from Makro worth R3 999. Read more about the winners and their awe-inspiring businesses in the latest issue of FAIRLADY magazine, on sale 21 August 2017!